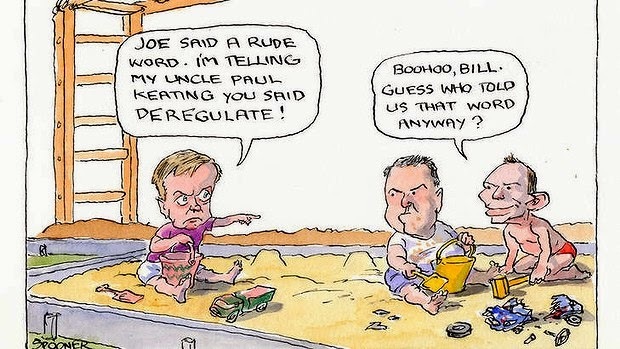 The Backyard Economist: Deregulation of University Fees "a dirty word"
Currently, domestic undergraduate students in Commonwealth supported places at public Australian universities, pay a contribution of their tuition fees and the Australian Government subsidises the rest. The student contribution is set by the government and varies according to discipline category of the courses studied, with the top band including law, accounting, economics and commerce charging $10,085 student contribution per year. Earlier in 2013 the Grattan Institute published Graduate Winners, a report which suggested that government subsidies for tertiary education should be cut, given the already strong incentives to pursue higher education, and the low net public benefits that students of certain disciplines accord to society. The acceptance in the G08 university community of the need for reform is at a level rarely seen on any issue. The directions for reform are similarly clear. As Melbourne University vice-chancellor Glyn Davis has pointed out, while universities have been hoping and lobbying for years for more government money, the decline in funding per student seems inexorable. There is therefore now a broader acceptance of the need for fee deregulation, particularly with the opening of university education to thousands more students, and the increasing private benefit to those who complete university studies. The Kemp-Norton recommendation seeks to level this playing field. First, it would reduce the cost to students of studying for higher education qualifications outside the university system. At present, most of these students have to cover the full cost of their course through the fees they pay, which usually means that they pay more than their university-enrolled counterparts. It’s hard to see the logic of this, given that these students are more likely to come from disadvantaged backgrounds. This is a great way of promoting access to higher education. Second, the proposal would introduce more competition into the higher education market. The Kemp-Norton review itself celebrates the effect that increased market forces have already on the sector, especially in lifting quality and encouraging innovation. But the impact of the market is highly constrained at present — by the near-monopoly given to universities over government-funded places, and by the controls imposed on universities in setting student charges. The Kemp-Norton recommendation removes the first these constraints and paves the way for removal of the second. Third, greater competition will bring with it greater diversity of institutions. For example, it would allow some institutions to focus entirely on teaching, unlike universities, which have dual missions of teaching and research. This would allow more specialised institutions to develop, addressing particular skills needs or student cohorts. Universities would have even greater incentive to play to their strengths, to improve quality and to articulate more clearly the benefits they offer compared to other types of provider — such as access to the country’s leading researchers in the classroom, opportunities to study in great universities around the world and qualifications that are highly sought after by employers. Applying some basic economics of commercial business some of the deregulation issues will be addressed. Generally speaking public investment and subsidies are typically inefficient but in some cases such as education they are seen as essential to growth (Espinoza, 2012). Some subsidies however create perverse mechanisms in dynamic contexts. The political economy of subsidies deals with the central question of how the political process interacts with the heterogeneity of interests in society to allocate subsidies and determine the pace of their removal. More specifically, do the decisions of elective officials always lead to the socially optimal use of subsidies in the manner described earlier? The conclusions of a number of studies (e.g. see Gardner, 1996) are that subsidisation is correlated with the political influence of the beneficiaries (e.g. retirees and the elderly in the case of social security or middle and upper class groups in the case of educational subsidies). Or in other terms the class of the graduates and the class of the university. A hierarchy of institutions results from their ‘donative-commercial’ revenue sources and from the radical differences among them in their successes -- past and present in raising and accumulating donative resources. These differences in donative wealth, in turn, strongly influence their current commercial circumstances. Schools that get a lot of donated money from endowments and legislatures and gifts can and do sell, in their commercial role, at a lower price or higher quality. “The market” for higher education is very different, then, from commercial markets and competitive market forces play out in much different environment. They may still work, perhaps, but they do so on a strikingly tilted playing field. Subsidies have wide ranging effects, for example mortgage subsidies and high wages in the public sector have created “queues‟: the benefits of landing a public sector job (or getting a subsidised mortgages) may be so high that some would rather wait and stay unemployed (or rent an apartment) in the hope of obtaining the coveted benefit later in time rather than going for an alternative (private sector job; commercial bank mortgage). Is it really that bad that there is an increase in university attendance due to low fees? Can we afford not to be competitive on a global scale in terms of education as wealth? Distortions are highly inefficient and may be worsened by further government intervention: for instance, a wave of hiring in the public sector may decrease labor supply to the private sector (or increase unemployment) since job seekers understand that the probability of landing a government job has increased. Therefore, the distributive policies in the case of education should be evaluated carefully, taking into account both theory and experience with specific government programs, so that this kind of egregious distortions be removed. So can this be done with higher education? Can the market stabilise itself with the help of the government or does it require intervention? Perfect competition – competition is affected between firms if they function in this kind of hierarchical market. Two things, I think, can safely be said: that competition will take place largely within segments or ‘bands’ or ‘packs’ of similar schools within the hierarchy and that it will have a very different character within differently positioned bands. For those market segments toward the bottom, competition takes rather conventional economic forms – a competition for customers of ordinary input quality that focuses therefore on numbers, on quantity of sales, on filling seats. It emphasises price, convenience, and quality for a customer of modest aims and it is most regionally or ideologically limited. For market segments at the top of the hierarchy, donative resources are great, student quality is important and amplified, competition is national, and it focuses largely on position and maintaining or improving student quality (Clotfelter, 1992).